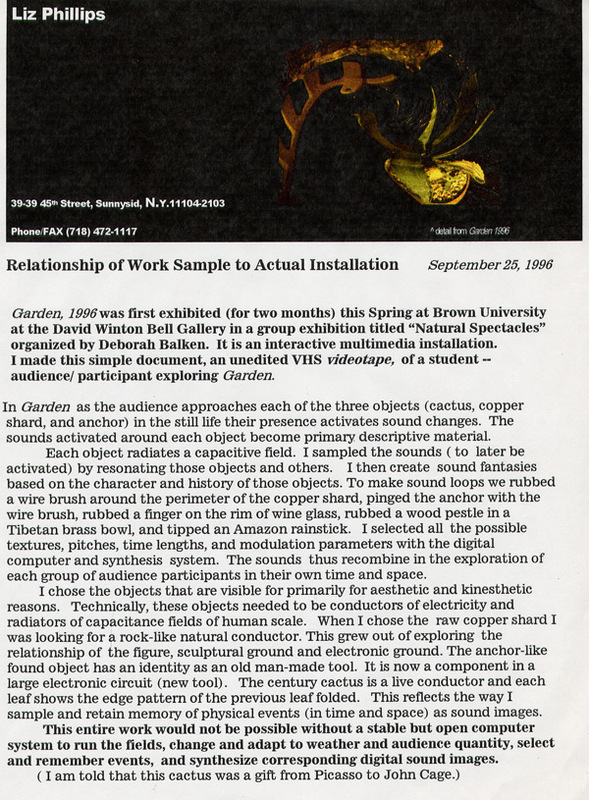 I have been making interactive installations for the past thirty five years. Sound is the primary descriptive material. I have used presence and movement of people, wind, fish, water, light, dance, video and sound as material. Usually in my sound installations the presence and movement and/or absence and stillness of the audience determine the combination of the soundscape. The audience finds, at the same time, that those sounds function to reveal three-dimensional forms that vary in depth and time. Delicate selection of presence, speed, and direction of audience movement within and along edges of these forms is detected (using capacitance radio frequency fields, computers, digital synthesizer(K-2000), and other custom equipment) and C++ programs (co-designed by Michael Wu). The change can then be reflected in sound and image. Voltages (potential energy changes) will first reflect movements near objects; then can be made to react to speed,change in direction, and save information about presence and nearness of audience/ participants. This information can then activate sound events, shift their pitch, timbre, and duration, and amplitude. Therefore, time duration and physical dimensions become weighed and proportioned into intervals that make a vibrant density visible. An illusion is created in three-dimensional space in the context of time space. An illusion is formed from events and memory. A succession of movements through intervals of time and/or space- or an interval where participants remain still can be measured and can acquire significance. Certain sound events will be associated with those specific physical events. In this way, through both sound and physical activity, an installation is composed and realized, to myself, and again differently to each audience in their own time and scale. These installations cannot be seen in a moment. It takes time to experience their facets. One needs to hear and repeat many events to experience their gradations and intersections?those sound images resulting in the context of their adjacent and simultaneous relationships.